MinC is the component of MinCDE system. Together with nucleoid occlusion it ensures that cell division will occur in the middle of a cell. Three proteins – MinC, MinD and MinE play different roles in preventing formation of division complex too close to cell poles . MinC is directly responsible for stopping the early stage of division by inhibiting the polymerization of FtsZ protein monomers into a structure known as the Z-ring . FtsZ is a tubuline homologue capable of creating chains, lariats and rings independently of other cellular factors . The stability and decay of these structures is dependent on GTPase activity of FtsZ proteins . At the beginning of cell division FtsZ monomers form the Z-ring to which other proteins responsible for the division are recruited. The presence of N-terminal domain of MinC prevents additional Z-rings from being established . MinCDE system and nucleoid occlusion. In bacterial cells MinC is recruited to membrane by the second protein of the system – MinD. This process involves C-terminal domain of MinC, which is also responsible for its oligomerisation. Recruitment to membrane is necessary for the inhibiting effect to occur at the physiological concentration of protein . Finally the third protein - MinE - is responsible for keeping the MinCD complex from acting in the midcell region, thus enabling the formation of Z-ring in the proper location . It was shown that mutants in either minC or minD divide at cell pole much more often than wild type, resulting in creation of nucleoid-free minicells. This mutations, however are not lethal because enough of the cells in population divide properly to sustain growth . Although MinCDE is mostly analysed in E.coli, it’s elements were found in many different bacteria groups including Proteobacteria, Deinococcus-Thermus and Firmicutes phyla . In B. subtilis the MinE protein is replaced by DivIVa which locates itself at the cell poles and with help of MinJ binds MinCD complex, decreasing it’s concentration at midcell . 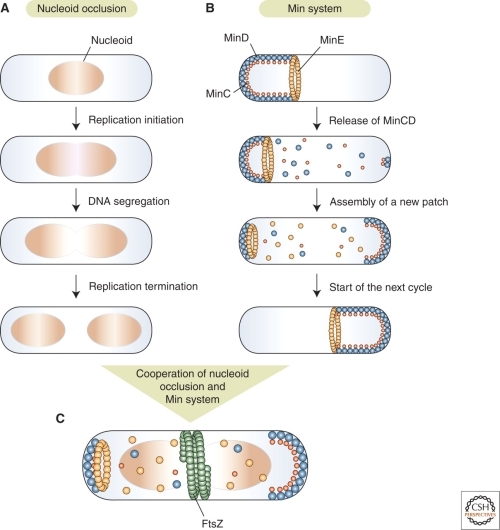 When expressed at high level MinC is capable of preventing bacterial cell from dividing. As a result, of this the cell becomes filamentus. This effect requires only high level of MinC, not MinD. It has been proven that overexpression of C-terminal domain of MinC alone is sufficient to inhibit cell division . Recent findings suggest also, that MinC originated from E.coli is able to function properly in B.subtilis and inhibit its division . 4. “The Switch I and II Regions of MinD Are Required for Binding and Activating MinC”, Huaijin Zhou and Joe Lutkenhaus, J Bacteriol. 186 (2004) 1546–1555.